CEOs are worried about competitive threats and market demands. Stakeholders are responsible for success, which is driving their concerns. Investors have money to lose and want a return on their investment. Project managers are seeking a successful project. Team leaders want to encourage team success. Peers who are waiting for others to finish, so they can get their work done. Jennifer said she could do a series on this topic, but for today she would offer two professional ways to deal with someone who micromanages you. There are several ways to implement this technique. The first is to provide awareness. Maybe the person doesn’t know that they’re micromanaging. Then you can ask questions to help understand where they’re coming from. Ask them, “What are your concerns, and how can I help?” The bottom line is that communicating with confidence and delivering results will free you from the shackles of micromanagement. If you don’t get any headway by address the person who is micromanaging you, then the only other option is to try and change your behavior. Communication is again key to help understand their work style. Are they looking for reports? Do they need status reports? Is that at a high level, with what amount of details? Also, what’s the frequency of these reports or status updates—hourly, daily? Then there’s the method they prefer to receive them: text, email phone, etc. Once you’ve gathered this information, you can adjust your workstyle to reflect what they want and when they want it, which should lessen their interruptions in your workday. Pro-Tip: If you’re on the fence as to whether you’re being micromanaged or even if you’re a micromanager, there are red flags to look out for. Some of the signs to look for are arrogance, not delegating and feeling stressed out. 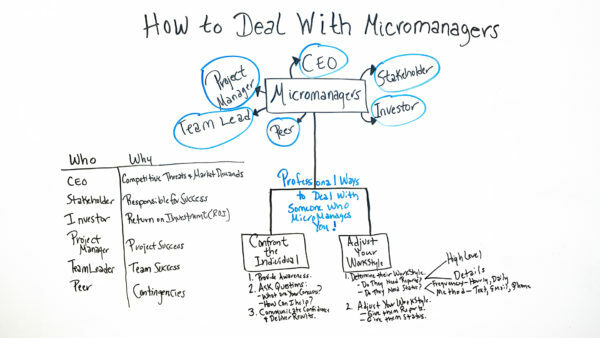 Today, we’re talking about how to deal with micromanagers. And when I see one come in I automatically think of that emoticon with the character with big eyes. We’ve all encountered them and I would submit to say that sometimes we micromanage. But in today’s whiteboard session, I wanna talk about when someone micromanages your work. So let’s talk about who some of the people are that we can encounter that micromanage us. It could be a CEO, it could be a stakeholder, investor, a project manager, team leader, even a peer. So let’s talk about why some of these people might micromanage. Number one, a CEO who is worried about the company, the total of the company. They’re thinking about launching new business lines. They’re worried about competitive threats. And they’re also worried about market demands, being able to meet them. Stakeholders are responsible for the success of the initiative that they’re on. Also, an investor has usually invested some type of money, or asset, or resource. So they think about, they’re worried about, they care about their return on investment. Also, the project manager is responsible for projects in total, and they’re worried about the project success. The team leaders are worried about their team success because typically if there’s a team leader, there may be multiple teams who also feed deliverables back and forth to each other. They’re also peers and sometimes peer who has contingencies on your work, they can’t get their work done until they get something from you. Sometimes they apply peer pressure. They can micromanage and it can be very frustrating. So let’s talk about some ways to handle this. I believe that there are some professional ways to deal with someone who micromanages you. So there are many ways and I could probably do a series on just this one topic. But today, I wanna talk about two ways. I think it’s kind of if you do one or both of these, you’ve got the 80/20 rule, you kind of handle it pretty much. But the first one is confronting the individual. A lot of times these individuals may be micromanaging, but they may not even have awareness of it. So number one, when you confront the individual, and I don’t mean that in a mean spirited way, you might just pull them aside or schedule some time with them for either a phone call if you’re remote, maybe sit down and have coffee or lunch if you’re…they’re local. But provide awareness and just ask them, you know, if they are aware that they’re even doing it. Sometimes, again, with stress factors, people don’t even realize what they’re doing. And ask them, “How can I help?” Again, bring awareness and figure out what is going on with them. And then once they tell you, you know, that’s information that you can take back and use for how you communicate with them. So be sure to take that information and communicate confidence. These people really, if they’re micromanaging, they really wanna ensure that things get done on time and that they get done correctly. So communicate confidence and deliver the results that they’re seeking. The other method is adjusting your work style. So again, I do believe communicating can take us very far. So communicating with that person or even assessing in your own mind. There are ways that we can assess somebody’s work style by just listening to the things that they say, the questions they ask, and their behaviors, we can assess it without sending them to go take some type of personality or behavior test. But determine their work style, maybe even ask them, “Hey, would it be helpful if I gave you some reports?” And if they say yes, you also have to determine, well, with this person’s work style, are they really looking for some kind of high level report or do they need more details? Depending upon which role I’m playing sometimes I can’t be bogged down with too much information. But I want a high level landscape or idea report of what’s going on. I’m very visual, so I like to see graphics, and pictorials, and illustrations. And sometimes depending upon another role I’m playing, I may need more details. I may have to get into the details and assess if…does this information sound right and do more critical thinking and problem solving. And ask them maybe about a status. Would it be helpful if you have a status? And ask them the frequency. Depending upon what type of project initiative or work you’re delivering, you may have to provide information or status hourly or even daily, it may be monthly or even quarterly. And then determine what method. You know, sometimes if you’re communicating with someone on an important project, maybe it’s urgent, yeah, you may have to text them, email them, or even initiate a phone call. Otherwise, it could just be like paper reports. And then adjust your work style by giving them the reports, giving them the status, and giving them the comfort level that everything’s okay, they’re gonna be taken care of, their needs are gonna be met. So whatever they’re responsible for, they’re gonna be taken care of. And then also I just think a bonus is always letting people know, “Hey, I’ve got you. I’m gonna have this taken care of.” Again, makes people feel confident that their needs, their worries are gonna be taken care of. But if you need additional resources on how to handle micromanagers, then sign up for our software now at ProjectManager.com.